Unlike the men, the Lady Pirates have yet to host a single opponent on their home floor this season. 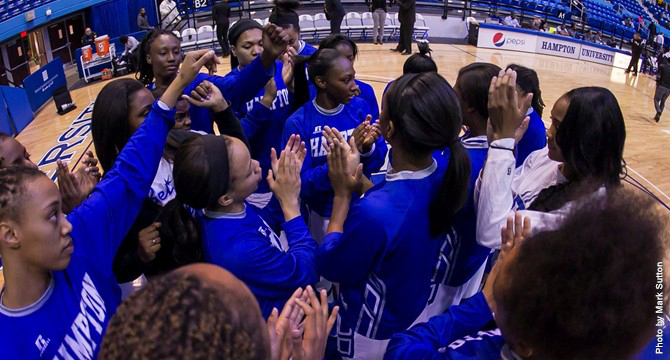 Their first home game is scheduled to take place on November 29 against James Madison at 5 p.m.
Hampton has played a roulette wheel of talented teams from conferences throughout the country to start the season away from the Convocation Center. Unfortunately, the team has not been able to find their groove and have lost their first four games, being outscored 225-327. The Lady Pirates’ last opponent on their grueling five game road trip was the Texas Longhorns in a game that was broadcasted nationally on the Longhorn Network at 7 p.m. CT on the day before Thanksgiving. The Longhorns ended up defeating the Pirates, 79-52. During his seven year tenure, head coach David Six is 6-17 all-time against teams from the Power Five Conferences (ACC, Big-12, Pac-12, SEC, Big Ten). Despite only scoring four points and grabbing four rebounds in Texas’ 70-47 win against Rice University on November 20, the 6-7 center is still a force to be reckoned with. In her first two games, Boyette scored a combined 36 points and grabbed a total of 24 rebounds. The Los Angeles native is currently ranked fifth in rebounds (9.3) and field goal pct. (67%); tenth in steals (2.3) and in the top-20 in scoring (13.3 ppg) in the Big-12 conference. The 2014-15 Big 12 Female Sportsperson of the Year is also averaging two blocks a game. Boyette was also named to the All-Big 12 First team last season after averaging 10 points and seven rebounds. 2. Which duo will outduel the other? Boyette and sophomore guard Brooke McCarty, who is tied for ninth amongst scorers in their conference (16 ppg), have formed a strong inside-outside duo this season. McCarty was named to All-Freshman team last season and entered the 2015-16 season as a starter after starting 15 games last season. The Texas twosome will have to battle the Hampton tandem of junior guard Malia Tate-Defreitas and 6-2 sophomore center Kaylah Lupoe. Tate-Defreitas was named the MEAC Player of the Year last season after leading the conference in scoring with 21.3 ppg. Her average also made her 14th in the nation in that category. Currently, she’s averaging 19.3 ppg. Lupoe, who started five times last season, has started each game and has already improved her stats, averaging 10 points and five rebounds. The game could be decided by which pair plays the best. Texas has the top scoring defense in their conference, holding teams to an average of 44.3 ppg. They also are ranked #1 in field pct. on the defensive end, resulting in teams shooting a dismal 29% from the field. Hampton, who has been allowing teams to shoot 49% from the field, will have to rely on their three point shooting. Currently, Texas’ opponents are averaging 30% from beyond the arc and Hampton is shooting 31% from long range. Being able to secure a rebound could be the difference between leading a game by two points or losing by two points. Texas has done an excellent job on the boards, so far, and are averaging 47 rebounds a game, with their highest rebounder being Boyette. Hampton is averaging 34 rebounds a game, with the 5-8 Tate-Defreitas leading the team with an average of 6.5. The Lady Pirates will need Lupoe and 6-0 senior guard Ryan Jordan to help Tate-Defreitas crash the boards and make their presence known on Texas’ floor. “Protection” is perhaps the most critical word used in sports. You have to protect yourself, your team, your lead and your floor at all times but both Texas and Hampton have found a way to exploit their opponents. Both teams rank in the Top-5 in steals in their conferences (Texas has 35, HU has 31) and a key steal could change the momentum at any time. Hampton’s hands will have to be quick and if they are willing to scrap, they could steal a massive victory on the road.